This is a rather simple work outfit, but it's comfy. Although I wear a range of different things to work, especially now that I'm a recent convert to wearing dress pants, I tend to reach for various dress and cardigan combinations the most, especially in winter. Those fleece-lined tights are warmer than my dress pants from Loft or Uniqlo, so it actually makes more sense to wear skirts or dresses this time of year. That White and Warren sweater I bought at deep discount on Gilt last December runs rather big, which you can probably see above. Even with mall brands known for a fair bit of vanity sizing, like J. 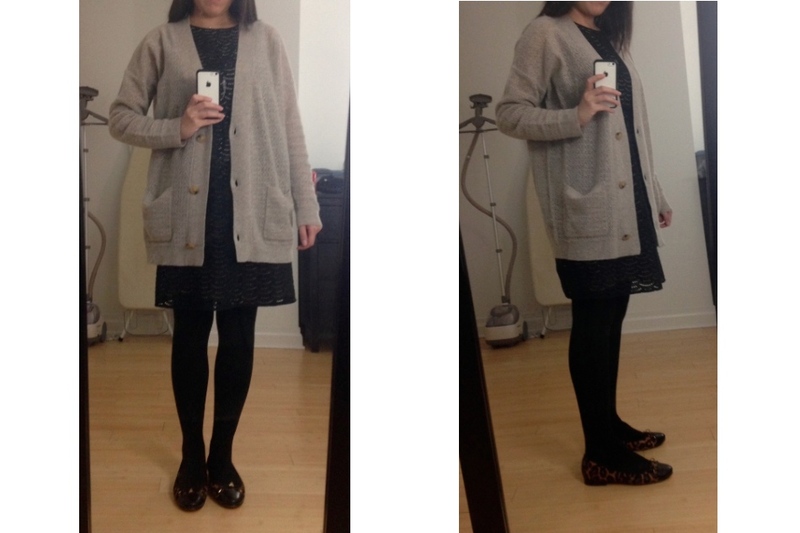 Crew or Ann Taylor, a size medium sweater is rarely noticeably big on me. Here, the White and Warren size medium is maybe too big, such that it's a little too baggy even if one has a trendy, slouchy look in mind. Nonetheless, I enjoy wearing this sweater: It was designed to be thin and has an open knit, but it's still fairly warm because it's cashmere. Although it might not be clear from the photo (someday I'm going to need to learn how to take better-quality photos), this Loft dress from quite a few seasons back is a black eyelet lined with beige fabric, all 100% cotton. It isn't the most suitable fabric for winter, but because I'm always bundled up in a heavy coat while I'm outside, I still wear some of my summer dresses to work in the colder seasons.